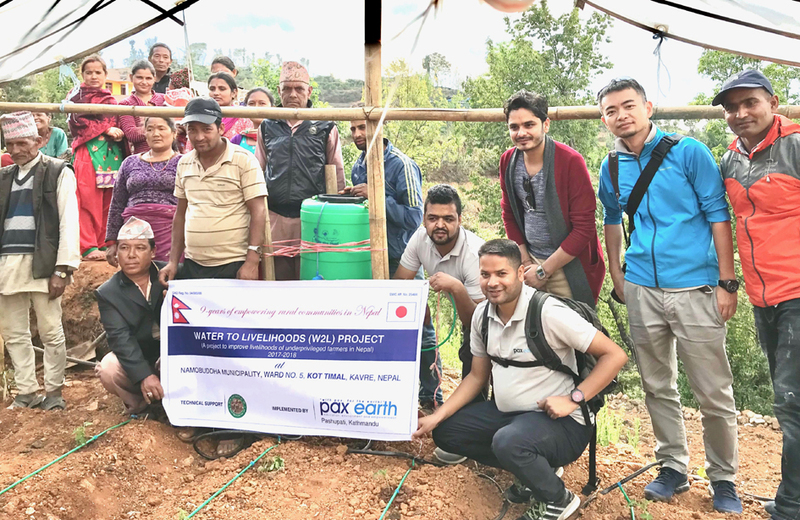 Pax Earth organised a drip irrigation workshop for the underprivileged farmers in Kot Timal village, Namobuddha Municipality, Kavre, Nepal under the project water to livelihoods (W2L) on May 4, 2018. 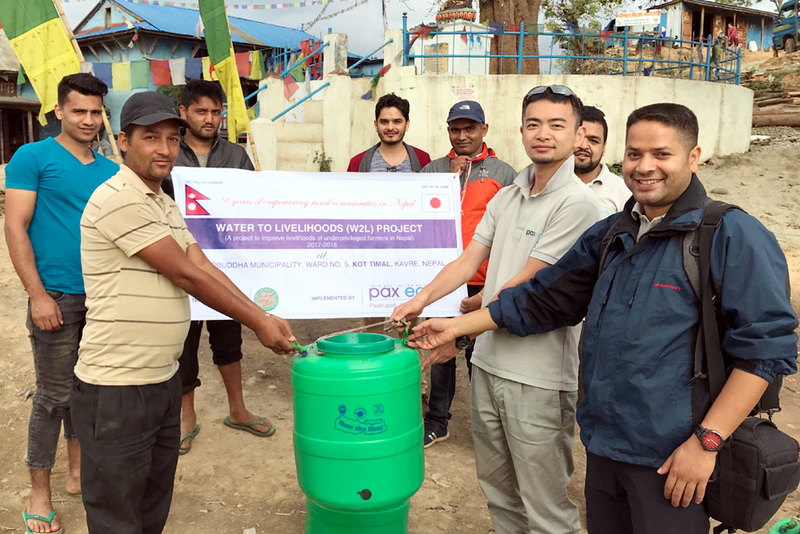 A Pax Earth team consisted of president of Pax Earth Nepal (PEN) Sujan Koirala, president of Pax Earth Japan (PEJ) Soko Aoki, member Sital Mainali, Toshimichi Kohama, well-wisher Kumar Mainali and resource person from Nepal Agro Live Pvt. 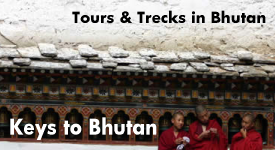 Ltd. Deepak Khanal travelled to Kot Timal village and conducted the workshop. On March 25, 2018, Pax Earth had conducted a nursery development training for the beneficiaries of the W2L project in Kot Timal village to grow healthy tomato seedlings. They learned to grow healthy tomato seedlings by planting seeds in the mixture of coco peat and vermicompost in a tray. Considering the time required for the seeds to grow into healthy seedlings, the drip irrigation workshop was organised after forty days of nursery development training to prepare the farmer for the plantation. The objective of the workshop was to educate the beneficiary farmers – how to set up the drip irrigation system in a plastic tunnel and how to plant the tomato seedlings in this system. The workshop was divided into two sessions: 1. Indoor orientation, and 2. On-the-field demonstration. Indoor orientation on drip irrigation was organised at Shree Raktakali Primary School. 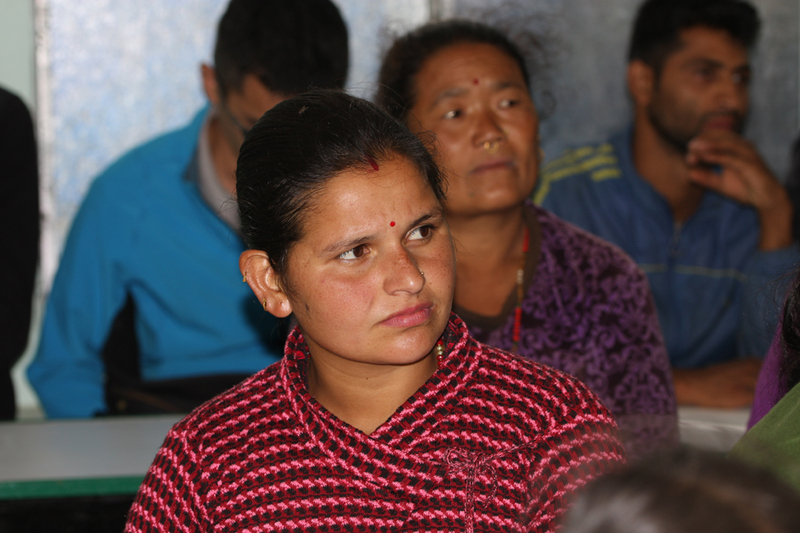 Twenty-six underprivileged farmers attended the session. 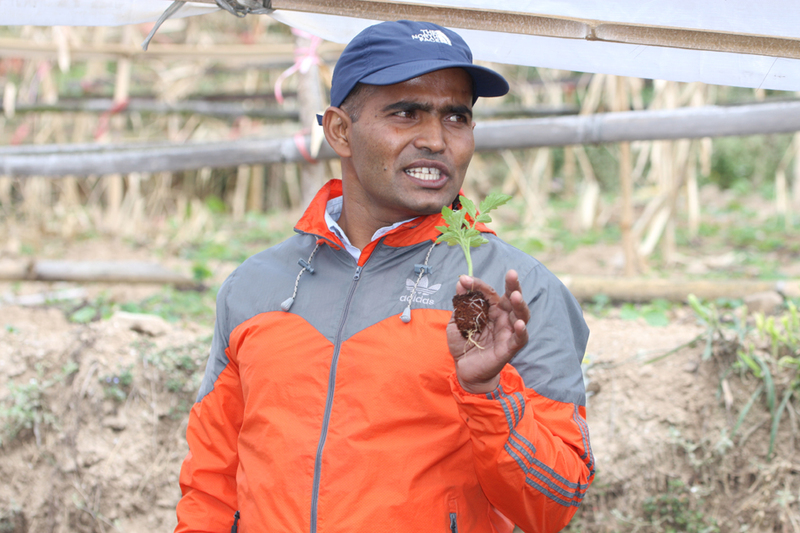 Deepak Khanal, a resource person from Nepal Agro Live Pvt. Ltd., gave a brief introduction of the drip irrigation system. 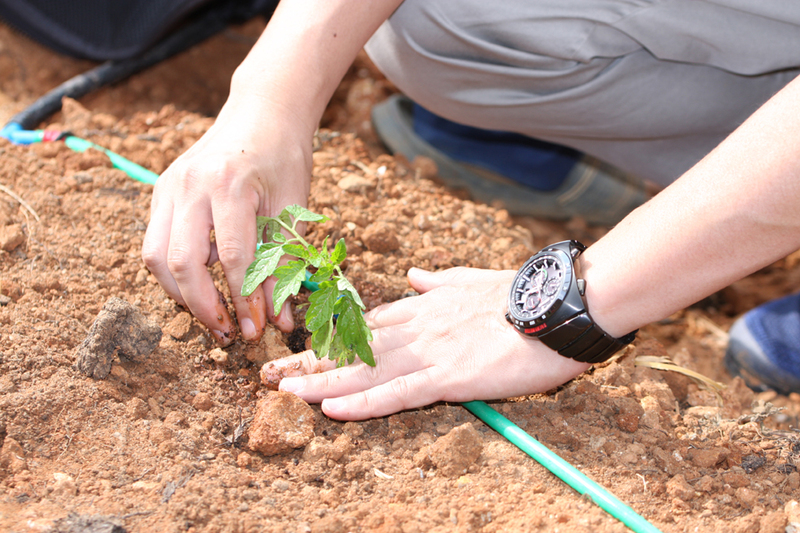 Drip irrigation is a micro-irrigation system that saves water and nutrients while irrigating plants. It ensures efficient use of water by allowing it to drip slowly to the plants either onto the soil surface above the roots or directly onto the root zone. 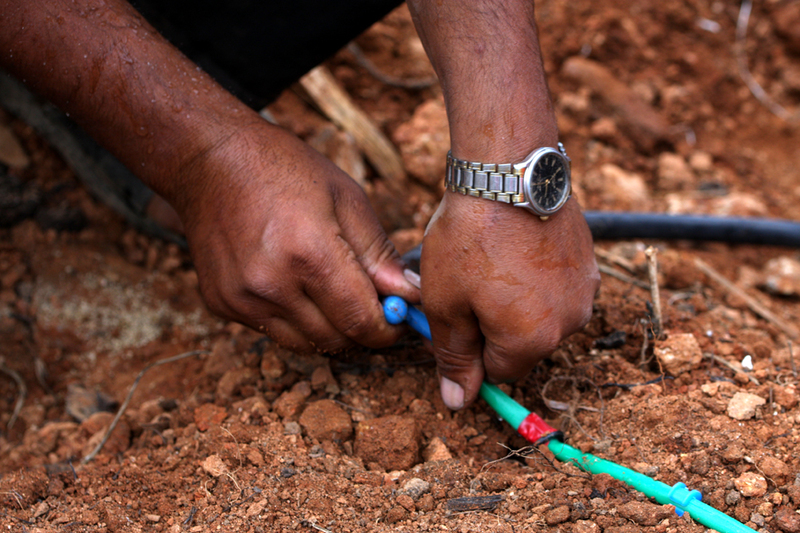 The conventional drip irrigation technology was first developed in Israel. But the technology was very expensive and small farmers in poor countries could not afford it. Despite its usefulness, it was not widely used by the poor who needed a better solution. 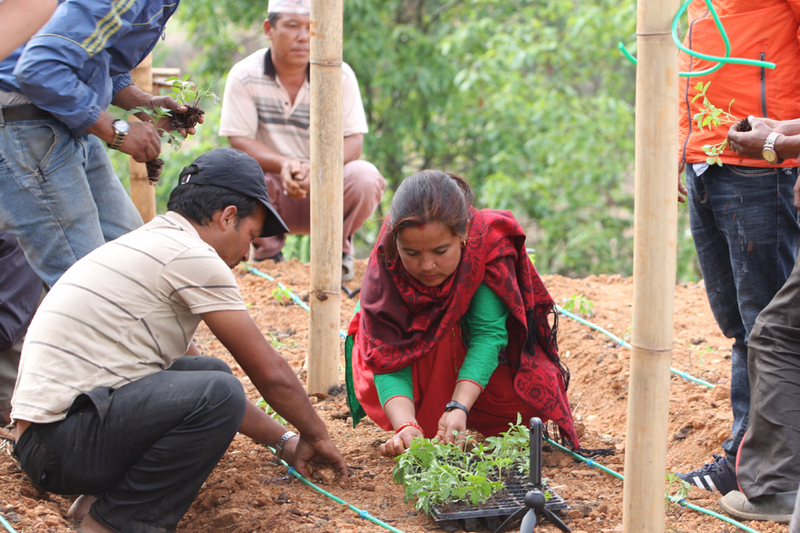 The simple, user-friendly and low-cost drip irrigation system was developed in Nepal by IDE Nepal in 1994. Pax Earth has provided the drip irrigation system developed by Sital Drip Irrigation Technology Industry. The Sital Drip Irrigation Technology modified the high cost conventional drip irrigation system popular in advanced countries to adapt to the needs of the small farmers of the water scarce hilly regions of Nepal. This system releases water directly to plants’ roots, minimizing evaporation and seepage losses. It is one of the convenient and efficient means of applying fertilisers to the crops. It not only saves water but also allows fertilisers to be mixed with the water and slowly dripped into the soil giving adequate time for the roots to absorb them. The system is very useful in Kot Timal where the scarcity of water has been a major problem particularly for agriculture and farming. The decade long water scarcity was, to some extent, reduced by Pax Earth with a launch of water to livelihoods (W2L) project in 2016. Pax Earth with the financial contributions of the community people and the staff of the World Bank Nepal Office helped the farmers in the Kot Timal village to create and maintain plastic ponds to harvest rain water under the W2L project. This has helped the community people to sustain cattle farming. Plastic tunnel is a simple greenhouse to manipulate environmental conditions for growing off-season vegetables using different sizes of drip irrigation technologies. The soil is covered with plastic sheets to increase temperature, retain moisture, promote seed germination and accelerate the growth and the development of the root and the whole plant. The plastic tunnels enable the farmers to shorten the growing season and to extend the harvesting time of many crops. The drip irrigation system is designed to fit in the plastic house for the commercially grown cash crops including tomatoes, cauliflower and cucumber. In 2017, Pax Earth added a value to the W2L project connecting a plastic pond to tunnel farming with a drip irrigation system. Total ten farmers could cultivate tomatoes in plastic tunnel with the aid of a drip irrigation system effectively utilizing the rain water harvested in the plastic pond. Result in the first year was not a huge success but the community people could realise that this system is an appropriate low-cost technology for cultivating high value crops in the Kot Timal village. This irrigation system uses water efficiently to increase productivity and income of small farmers. The Pax team conducted a demonstration at a farmland of Man Dhwoj Tamang, a beneficiary farmer. As the tomato seedlings have grown enough for plantation and the plastic tunnel has been created as well, the team could demonstrate the process from installation of the drip irrigation system to plantation of tomato seedlings. 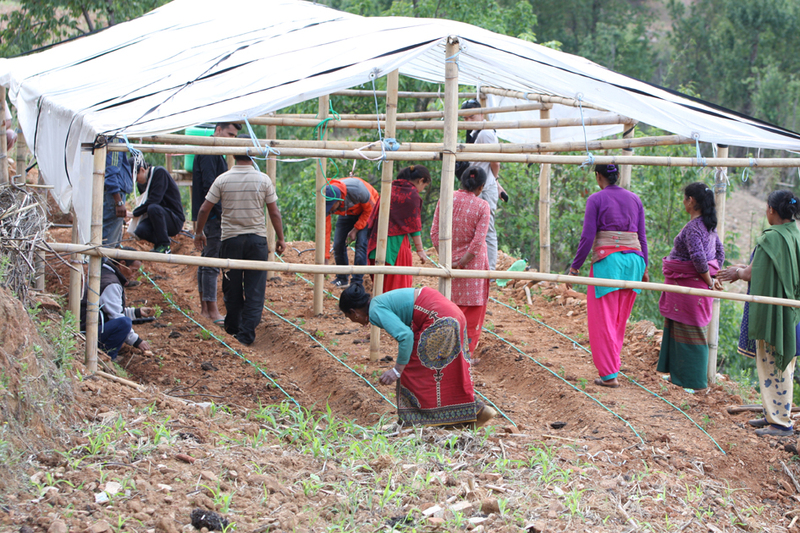 Starting with a field preparation, the farmers installed the components of the drip irrigation system including plastic water tank, pipes, fittings, and drippers under the guidance of expert Khanal. 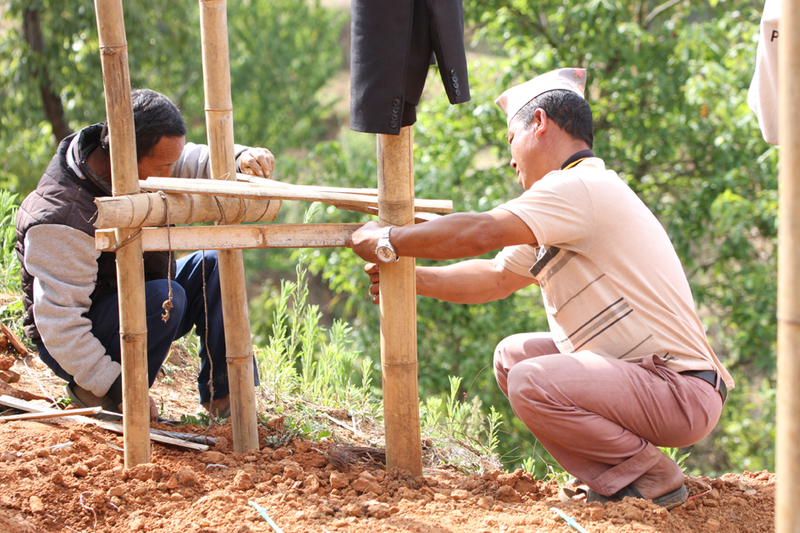 The farmers made a tank stand using bamboo, wood and iron wire. The tank is connected to the plastic pond where rain water has been harvested. The team trialled the system to check the operation. The drip system worked properly. Then, the farmers planted healthy tomato seedlings at the wet part of the soil where the water was dripped. A 5-line drip irrigation system (each line with 20 drippers) was installed at that farmland. Hence, in total 100 tomato seedlings were planted. The plastic tunnel was already set up, but it was not in a proper shape. Khanal adjusted the tunnel and Silpaulin to make it standard. Besides, he gave some useful tips to cure some common diseases in tomato cultivation. Twenty farmers attended the demonstration. Everyone was so excited to learn to prepare the land, set up the drip irrigation system and plant seedlings practically. President Koirala and president Aoki jointly handed the drip irrigation system and Silpaulin sheets to three new beneficiaries – Dev Raj Khakurel, Uttam Prasad Badal and Ashakaji Tamang. With an addition of these three, the number of beneficiaries of the W2L project extended to twenty-six. On behalf of the farmers, Dev Raj Khakurel heartily thanked resource person Khanal for such a useful orientation and demonstration on drip irrigation system. He expressed a sincere gratitude to Pax Earth for organising the important workshop. Pax Earth extends a sincere gratitude to resource person Deepak Khanal from Nepal Agro Live Pvt. Ltd. for the effective orientation and demonstration sessions. Pax Earth would thank Dev Raj Khakurel for his sincere effort to gather farmers, managing the room and field for the orientation and demonstration. We are thankful to all the farmers for their active participation in both the orientation and demonstration. Pax Earth team deserves a great appreciation for conducting the workshop successfully.